In the racing world speed is of the essence and the Danehill “brand” has proved remarkably effective at producing a long line of fast hoses and dominates the sires’ list. 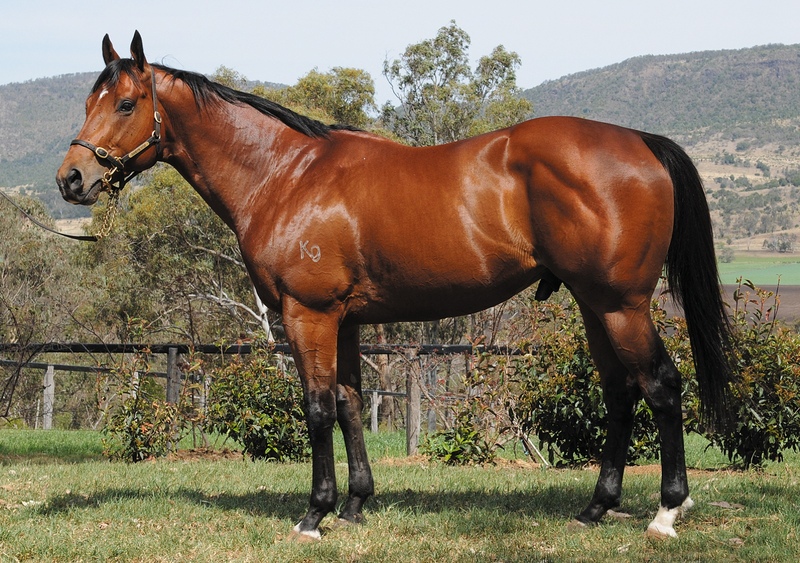 Golden Archer, a grandson of Danehill, lived up to his pedigree with five of his eight wins coming in stakes company and he’s proving very popular at Raheen Stud in Queensland where he will soon cover his third book of mares. SPRINTING stars from the Danehill (USA) male line have an outstanding record at stud and veteran stud master Basil Nolan is banking on Golden Archer coming up trumps for Raheen Stud. There’s pretty compelling evidence this son of Rock of Gibraltar (IRE) will be a success on the Darling Downs as he won eight of 20 starts to 1200m and almost $700,000. What’s more his first three dams all earned black type and stallions in his dam’s immediate pedigree include Snippets, Kaoru Star, Biscay and Showdown, all wonderful sources of speed. They are great ingredients to add to the mix with Rock of Gibraltar (Danehill-Offshore Boom by Be My Guest) who was Horse of the Year and Champion Three Year-Old Colt in Europe in 2002 and has left more than 90 stakes winners around the world. Golden Archer won by a similar margin next time out over 1000m at Caulfield on Boxing Day, carrying 57.5kg to run 57.67 on a good track. Stepped up to Listed company next time out on Australia Day, he was third in the Blue Diamond Preview behind Sepoy on a dead track and then ventured to Tasmania to claim that state’s biggest juvenile test, the Gold Sovereign Stakes-LR (1200m, slow), from Triple Asset on February 10. Jockey Luke Nolen said the colt was never comfortable in the going. “He won it on raw ability and that says a lot for his character,” Nolen said. He made back-to-back black type wins in claiming the Festival of Racing Stakes-LR (1000m), running 57.76 on a dead track at Flemington on March 5 and two weeks later recorded another brilliant win at Moonee Valley, clearing out in the Listed St Albans Stakes (1000m in 58.48) to score by 4.25 lengths in a race previously won by good sires Bel Esprit, Oratorio (AUS) and All American. Taken to Sydney for the Pago Pago Stakes-Gr.2 (1200m) at Rosehill on March 26, he was fourth on a dead track behind Salade. Off the scene until August 13, Golden Archer was not disgraced when second behind champion Sepoy in the Listed Vain Stakes (1100m) at Caulfield after losing a plate in running. This track was the scene of his biggest win next start when he took the H.D.F. McNeil Stakes-Gr.3 (1200m) on August 27, beating Cross of Gold by 1.75 lengths and with Vatican third in 1:09.04 after a check at the start. However that plan was not to be as the colt was sent for a spell after an unplaced run behind Helmet in the Caulfield Guineas Prelude (1400m) on September 24. He would not appear on the track until the following July following an accident in the spelling paddock when he got his leg caught in a hole in a fence. Although not severe, the cut was in an awkward place on a joint and took time to heal. Golden Archer made a triumphant return to racing on July 21, 2012 when he cleared out for a two-length win over 1000m at Flemington, carrying 58kg and running 58.07 on a dead track. At his next start he was a length behind Shanghai Warrior over 1200m (slow) when second in the VRC Aurie’s Star Handicap-Gr.3 at Flemington and was back in the winner’s stall on September 1 after a 1.25 length success in the MRC Health Stakes-LR at Caulfield, running the 1100m in 1:02.72 on a dead track, beating Mr Make Believe and Platelet. Although this was his final win, the horse was not disgraced at his final starts, running fourth to Bel Sprinter in the Ian McEwan Stakes-Gr.3, and second to Buffering next time out in the MRC Schillaci Stakes-Gr.2 (1000m). He was fifth in the Yellowglen-Gr.2 behind Fontelina and second to General Truce in the Century Stakes (1000m) at Flemington on November 8, 2012. His final campaign began with a third behind stable mates Black Caviar and Moment of Change in the VRC Lightning-Gr.1, the unbeaten mare breaking a 25 year-old track record to run 55.42 (clipping 0.08 off Special’s time) in a race she was winning for the third time and which is now named in her honour. Golden Archer was unplaced in the Challenge Stakes-Gr.2 at Warwick Farm mid-March and was then galloped on when unplaced in The Galaxy-Gr.1 behind Snitzerland. It was his final run and left him with a record of eight wins, four seconds, a third and two fourth placings in 20 starts for earnings of $676,950. “Golden Archer has been a great stalwart for our team. During the past two and a half seasons only Black Caviar has won more black type races for the stable,” Peter Moody said when announcing the entire’s retirement. “Unfortunately he was galloped on in The Galaxy. The injury was not severe however, combined with normal racing wear and tear, plus with him being a stallion we have decided the timing was right to retire him to stud. You would love a stable full of him. He is just a professional racehorse. He is just a tremendous horse. He is a bloody good horse too. a sure sign breeders love his foals, who throw to their handsome bay sire. Rock of Gibraltar, sire of Golden Archer, was one of the very best racing sons of nine-times Champion Australian Sire Danehill (Danzig-Razyana by His Majesty). His 10 wins (five at two, five at three) included the English and Irish 2000 Guineas-Gr.1, the Sussex Stakes-Gr.1, the St James’s Palace Stakes-Gr.1, the Dewhurst Stakes-Gr.1, Prix du Moulin-Gr.1 and Grand Criterium-Gr.1 and he was also runner-up in the Breeders’ Cup Mile-Gr.1. Danehill’s sire sons also include Danzero, Flying Spur, Danehill Dancer (IRE), Exceed and Excel, Fastnet Rock, Catbird, Commands, Danewin and Redoute’s Choice and the breed dominates Australian pedigrees in this new century. Rock of Gibraltar is credited with 950 winners (61.3% of starters) of more than $96m and his 98 stakes winners (6.3% of starters, 11 Gr.1) are led by Gr.1-winning fillies Diamondrella (Dixieland Band), Society Rock (Key of Luck), Europa Point (Woodman), Alboran Sea (Toolighttoquit) and Samitar (Rainbow Quest), while Gr.1-winning colts include the Eclipse Stakes-Gr.1 winner Mount Nelson (Selkirk, at stud), Hong Kong Cup-Gr.1 winner Eagle Mountain (Darshaan), Seventh Rock (Rubiton, at stud), Prince Gibraltar (Pennekamp), Epsom Handicap-Gr.1 winner Rock Kingdom (St Covet) and Champion French Three Year-Old Miler Varenar (Mr. Prospector), winner of the Prix de la Foret. Rock of Gibraltar’s dam, Offshore Boom, is a Listed placed winner and dam of six winners by the very good miler and sire Be My Guest (Northern Dancer), while second dam, the winner Push a Button, is by Bold Lad (Bold Ruler) and is a half-sister to Gr.1 winner and sire Riverman (Never Bend-River Lady by Prince John) and from the same Nasrullah male line as Push a Button, which could make for interesting inbreeding (Golden Archer/Riverman cross). If you look at the success of Anabaa, who is by Danzig and whose dam is out of a Riverman mare, with Golden Archer’s female line, then daughters of this champion sprinter look tailor made for Golden Archer. to Marceau, Zasu and Joy Love and from one of the best families, that of No Finer’s dam Humour (Pirate King (GB)-Real Delight by Nilo (GB)) cultivated by the late Lionel Israel when he owned Segenhoe Stud at Scone. Pins has done sterling service at Waikato Stud where his stock include the Cox Plate winner El Segundo (Oak Ridge), star filly Legs (Centaine), Caulfield Guineas-Gr.1 winner and sire Econsul (Centaine), Hong Kong Mile-Gr.1 winner Ambitious Dragon (Oregon), dual Guineas winner Katie Lee (Spectacularphantom) and Porotene Gem (Danzatore). He is a son of the Oakleigh Plate-Gr.1, The Galaxy-Gr.1 and AJC Sires’ Produce-Gr.1 winner and terrific sire Snippets (by Dewhurst Stakes-Gr.1 winner Lunchtime (GB) and from noted producer Easy Date by Grand Chaudiere (CAN)). Next dam Bali Sugar (NZ) was Gr.3 placed and won four races to 1200m. She is by talented juvenile Christmas Tree (Biscay-Joy and Fun by Showdown (GB)), who won the Pago Pago Stakes-Gr.2 and is a grandson of another very good producer in Denise’s Joy (Seventh Hussar (FR)). Bali Sugar’s five winners also include Butterscotch (Gold Brose), a Gr.3 winner rated the Best Older Female Sprinter in NZ in 2001-02. Golden Archer’s third dam, the Gr.3 winner Tasman Dancer (New Regent (CAN)-Rangiora by Greenwood (FR)) produced seven winners including Listed winner Dansaar, while her Gr.3 placed daughter My Marilyn is the second dam of Gr.1 winners Headturner (Anabaa), Anacheeva (Anabaa) and O’Marilyn (O’Reilly) and Gr.2 winner Kroner (Viking Ruler). This is family 2j and fourth dam is good city winner and Listed fourth Rangiora, by the Habitat son Greenwood (FR) from Maori Rhythm by Sostenuto (a connection that could prove useful using daughters of Danzero, whose dam is by Kaoru Star from a daughter of Sostenuto’s half-brother Idomeneo (GB); or descendants of Luskin Star, the Golden Slipper winner bred on the Kaoru Star/Idomeneo cross). While his third, fourth and fifth dams are Australian-bred, we return to an established NZ family for his next dam Rahui (NZ) (Count Rendered (GB)-Cherry’s Ticket by Croupier). This is a branch of the family founded by Roscommon (GB) (Common-Rosamonde by Hermit) who arrived in NZ early last century, this branch via a daughter Tivoli (Absurd), whose members include the Great Northern Oaks winner Foxmond and her sister Volifox (Foxbridge (GB)-Volimond by Lomond (GB)), dual Derby winner Ben Lomond (Test Case (GB)), Victoria Derby winner Handy Proverb (Twig Moss (FR)) and Caulfield Cup winner Swell Time (Mellay (GB)). Golden Archer traces to Stage Fright, a sister to Volimond. she landed in the “colonies” more than 100 years ago.